DA Form 67-10-4 also known as the Strategic Grade Plate General Officer Evaluation Report is a form used for evaluating Brigadier generals and higher ranking officers. The report compiles valuable information about the rated officers' competence, mental and physical condition and potential for promotion and is forwarded to the Department of Army Headquarters (HQDA) for review. The latest edition of the General Officer Report was released by the Department of the Army (DA) in November 2015. An up-to-date fillable DA 67-10-4 is available for download below. The form - sometimes referred to as the DA Form 67 for short - should not be confused with the DD Form 67, Form Processing Action Request, used to request a cancellation or revision of an existing Department of Defense (DoD) form or to add a new publication to the DoD library. What Is DA Form 67-10-4? The DA 67-10 series was introduced by the Department of the Army on April 1, 2014. The DA Form 67-10-4 - or the GOR-OER - is meant to analyze and rate officer performance more accurately and in line with their specific duties. All forms in the DA 67-10 series replaced the single universal DA Form 67-9 which evaluated officers with no regard to their rank. The General Officer Report is prepared a rater, senior rater and an intermediate rater, that may be invited into the evaluation process. The evaluation itself includes close supervision, skills assessment, a face-to-face discussion and a personal skills evaluation done by the officer being rated. For use of this form, see AR 623-3; the proponent agency is DCS, G-1. c. This is a referred report, do you wish to make comments? Comments required for "Failed" APFT, or "Profile" when it precludes performance of duty, and "No" for Army Weight Standards? Part I, Administrative Data provides identifying information on the officer undergoing evaluation, including their name, rank, unit as well as number of rated months, non-rated time codes, and the reason for filing the GOR-OER. Part II of the GOR-OER is used for authentication by both the rated officer and rating officials. The GOR-OER must be signed by all parties 14 days prior to the THRU date on the report. Part III, Duty Description gives a description of tasks and duties performed by the rated officer. All information must be given in full and needs to be factually correct. Part IV is meant to evaluate the professionalism, competencies, and attributes of the officer. It provides an assessment of a rated officer performance according to the listed criteria. Part IV describes the officer's characteristics, physical strengths, and intellectual aspects. Part V is the senior rater's evaluation of the potential of the rated officer. The officer must file DA Form 67-10-1A (or any equivalent) to provide additional personal information meant to assist the senior rater and supplement the reports and records given for review. DA Form 67-10-1 is the Company Grade Plate (O1-O3); WO1 - CW2) Officer Evaluation Report or CGP-OER for short used for evaluating 2LT officers through CPT and WO1 through CW2. 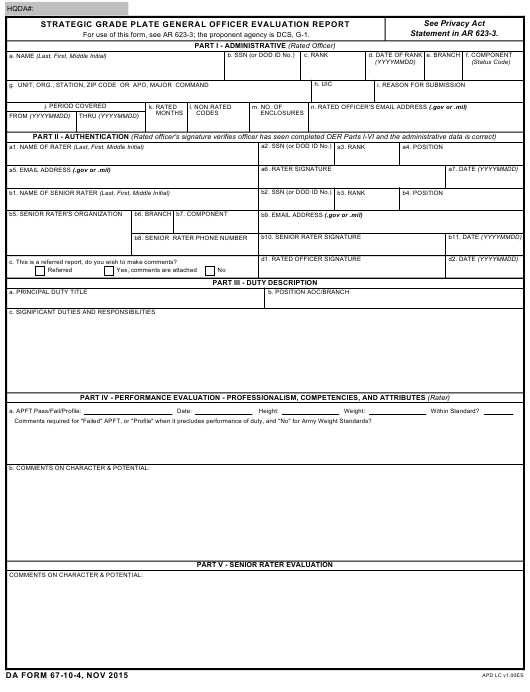 DA Form 67-10-2, Field Grade Plate (O4-O5; CW3-CW5) Officer Evaluation Report is a report similar to the DA 67-10-4 but used when evaluating officers ranked major, lieutenant colonel, and chief warrant officers levels three to five. DA Form 67-10-3, Strategic Grade Plate (O6) Officer Evaluation Report is used only to evaluate colonels.